No Country for Old Men starts out at like a modern-day western, then it begins to look like a cape thriller, before turning into a full-blown bloodbath… which involves a psychopathic killer with a really bad haircut. I expected this film to be a majestic, artsy piece of cinema and while it certainly was that, the twisted plot is something I did not see coming at all. 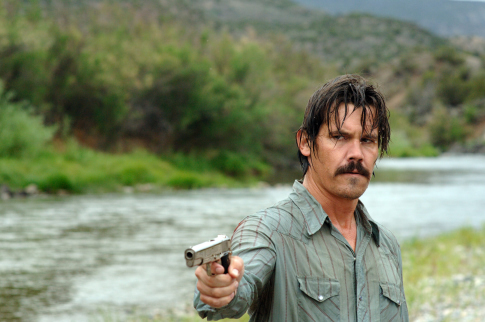 Josh Brolin plays Llewelyn Moss, a Vietnam veteran who stumbles upon the aftermath of a drug deal gone wrong. It’s here he finds two million dollars in a briefcase. He has two options: take the money and risk being hunted down, or go home empty handed, back to living in his trailer park. Of course, he grabs the money, runs and doesn’t look back. He was never really going to say no, was he? But he may have thought twice if he knew contract killer, Anton Chigurh (Bardem) would track him down like the Terminator. What follows is a dark and nerve-wracking chase movie where both the good guy and bad guy take centre stage. I’ve always said Heath Ledger’s The Joker is the best movie villain I’ve ever seen, but Bardem’s Chigurh is on par. He’s everything a great, memorable villain should be: truly evil, psychotic and unstoppable. Chigurgh will do anything to get the stolen money he has been hired to recover and his determination is almost supernatural. He doesn’t seem quite human. Everything about him is utterly menacing. Bardem definitely deserved that Oscar for Best Supporting Actor for this role. No Country for Old Men is packed with explosive violence and tense scenes, but it’s also an examination of how various characters deal with such a heartless human being. Chigurh has no feelings, is obsessed with chance and ordinary people are faced with this incomprehensible evil. The old man of the story, Sheriff Ed Tom Bell (Lee Jones) is one of these people. He’s tasked with bringing down Chigurh, but unfortunately, he’s always two steps behind. That’s all I’ll say about the story. It has many shocking moments that you don’t see coming. The Coen Brothers show no mercy for the viewer, forcing us to look at a soulless, empty landscape filled with vengeance and mayhem. Very entertaining stuff! This is overall a great film; a masterful execution of character, action and setting. Although No Country for Old Men ends on a lacklustre note, I still love the film for its compelling story and mesmerising thrills. Check out the trailer below and see this film ASAP! Stars: Tommy Lee Jones, Javier Bardem, Josh Brolin. Glad you enjoyed it and yeah the sound design is interesting. And thanks for reading. Isn’t it incredible? Without a doubt, one of the finest films I’ve ever seen. A masterpiece in every meaning of the word. I really admire the thought-provoking discussion it creates. Some theorize that Sheriff Bell actually is Anton Chigurh. There’s a lot of interesting theories to read online, if you’re interested. Also, I’d recommend checking out the Cormac McCarthy novel of the same name that it’s based on. While the film is a very faithful adaptation, the book is still a great read. And while the ending may have disappointed you and most others, it ends exactly the same as the novel. I think the most frustrating part about it is that it’s so abrupt and also hard to make sense of. I don’t know what the dreams meant, and I wish I had a better grasp on their significance. Once again, great review. I really enjoy your writing! You inspire me to write more myself! This is a great film, yes. Nice to see you agree and okay I’ll have to check out these theories! I was meaning to have a read of the novel at some point too. The ending didn’t sit well with me, but it didn’t ruin the rest of the film at all. And thanks for all these comments by the way, and I’m really glad you enjoy my writing!